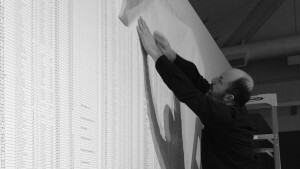 Installation of “Names of the Student Earthquake Victims Found by the Citizens’ Investigation” (2008–2011) in the exhibition Fault Line: Ai Weiwei curated by Ian Boyden at the San Juan Islands Museum of Art, 2016. Photograph by Ian Boyden. In the 2008 Sichuan Earthquake, 5,196 schoolchildren were killed when their poorly-constructed schools collapsed. In an effort to conceal the corruption behind the schools’ construction, the government often brutally prevented parents and citizens alike from procuring the facts of who died, how many, and why. It wasn’t until Chinese artist Ai Weiwei, at great risk to his own safety, set about gathering the names of the children that the corruption was exposed and the names of the children were cataloged. As part of an exhibition I curated of Ai Weiwei’s work related to this earthquake, I papered a wall with the names of these children, a massive work on paper consisting of 21 scrolls, together measuring 10.5’ tall by over 42’ long. 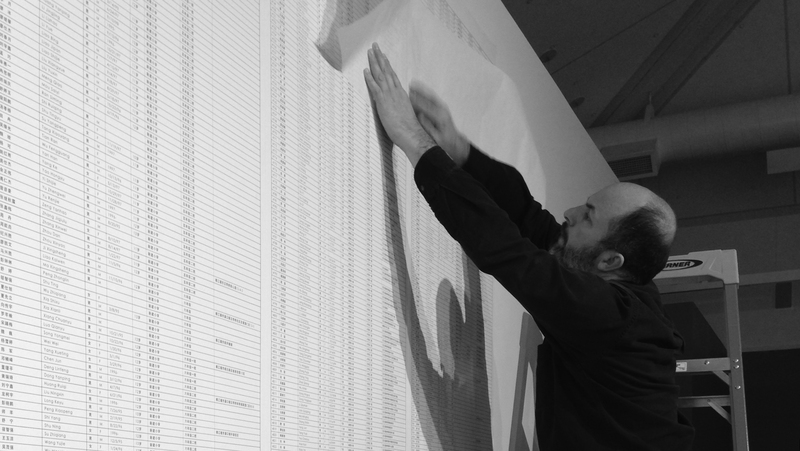 Ian Boyden installing “Names of the Student Earthquake Victims Found by the Citizens’ Investigation” (2008-2011) by Ai Weiwei. Photograph by Patricia Bolding. Hanging the scrolls took days. Each scroll had to be pasted on the back and then smoothed by hand, inch by inch, over the wall. I passed my hands over the names. The names stretched out like infinity. Each name had been a life. I read them aloud in the empty museum, ephemeral blossoms of sound. I marveled at the poetry of the names, the subtle meanings, seasonal images, literary references, philosophical challenges—each name brimmed with love, containing the hopes and dreams of the parents, as well as a challenge from the child who bore it. For me, the challenge was to give these names a kind of language so they could continue to speak. Returning to the etymology of the original characters is a practice in a different kind of translation: translation from one language to another certainly, as well as from one time to another, and from a character to a poetic rendering. It’s in the poetic rendering that I hoped to impart a sense of individuality of a person to the English reader, something that is hard to achieve when reading a foreign name that does not hold a recognizable history of meaning. Holding the hopes implicit in these names in tension with the tragedy of the children’s deaths has also been a translation of one grief to another: perhaps this is the most accurate translation of all. Chinese characters typically have a multiplicity of meanings, which are clarified by context. But with a name, there is little or no context, and I have no way of reaching out to the parents to find out what their intentions were. This leaves me alone with raw material and my own empathy. Ai Weiwei sees our world as profoundly lacking in compassion, that were our decisions driven by compassion, we would avoid or at least alleviate suffering. A primary driver of compassion is empathy. But empathy cannot be imposed, rather it must arise from within, an element that binds us to each other. For me, the empathetic demand is the great gift of his work to our culture and to myself. Ai Weiwei uses Twitter as a primary means of communication. From 2009–2017, he tweeted the names of these children every day on their birthday, continuously calling for those responsible for the deaths be held accountable. The tweets simply read: “Today is the birthday of [x] number of students who were killed, they are:” and then the list of names, followed by the hashtag #512Birthday. Each morning for one year, I read the names, translated a few of them, and then wrote a meditative response. My daily responses fit the 140 character count of the Twitter platform. And then I tweeted it to Ai Weiwei and the rest of the world. In the year that followed, I returned to each poem on its given day, revising and expanding on themes I had discovered in the process. 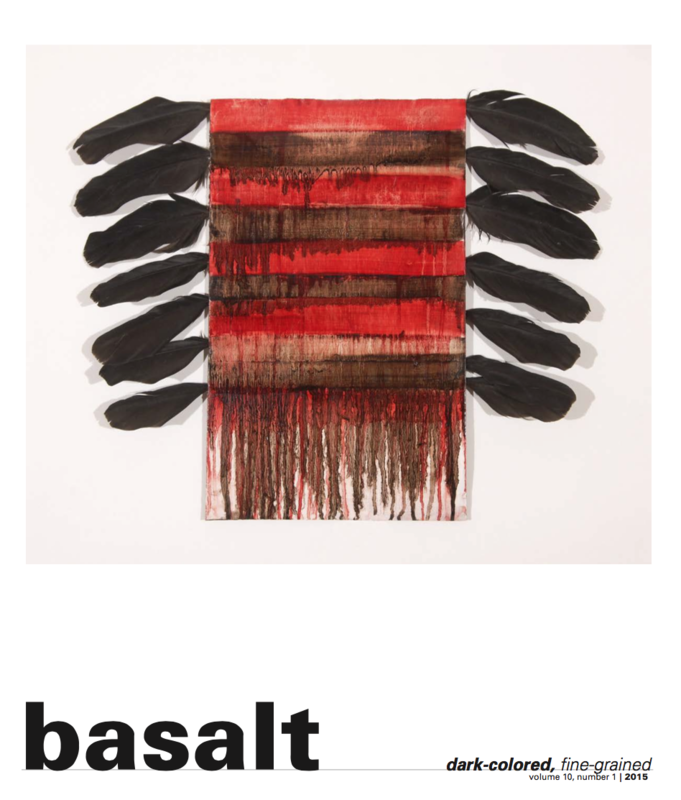 What follows are selections of these poems presented in monthly installments.